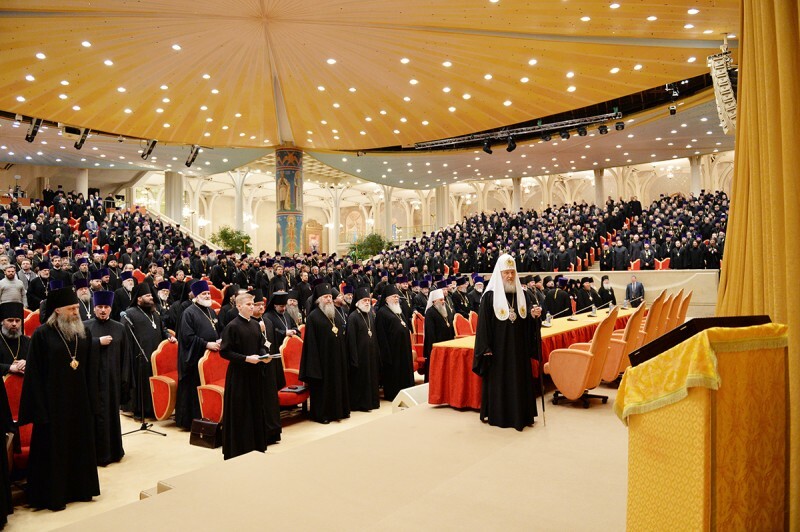 December 20, 2013 – An annual Moscow diocesan assembly began its work at the Christ the Saviour’s Cathedral’s hall of church councils, chaired by His Holiness Patriarch Kirill of Moscow and All Russia as ruling bishop of the capital city. The assembly presidium includes Metropolitan Juvenaly of Krutitsy and Kolomna, patriarchal vicar of the Moscow diocese; Metropolitan Varsonofy of Saransk and Mordovia, chancellor of the Moscow Patriarchate; Metropolitan Hilarion of Volokolamsk, chairman of the Moscow Patriarchate’s department for external church relations; Archbishop Arseny of Istra, first vicar of the Patriarch of Moscow and All Russia in Moscow; and Archpriest Vladimir Divakov, patriarchal secretary for Moscow. The diocesan assembly is attended by vicars of the Moscow diocese, members of the diocesan council and council of the vicariates, deans of church districts in Moscow, rectors and clergy of Moscow parishes, abbots and abbesses of monasteries and convents in Moscow and chairmen of parish councils. Archbishop Arseny was elected deputy chairman and Archpriest Vladimir Divakov secretary of the assembly.